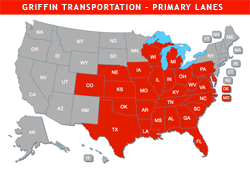 Griffin Transportation, Inc. has freight carrier operating authority throughout the continental United States. In the map below, areas served with current primary lanes are indicated in red. Areas indicated in gray can also be served through any of Griffin’s transportation offerings.